Lander City Hall is located at 240 Lincoln Street, Lander, WY 82520; phone: 307-332-2870. Photo: Downtown Lander, ca. 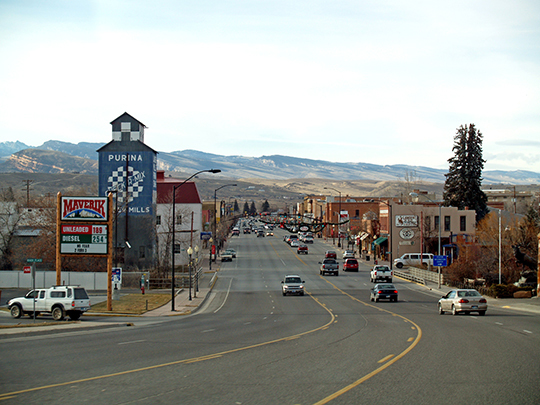 2008, seat of Fremont County, Wyoming. Photographed by User:PDTillman (own work), 2008, [cc-by-2.0 (creativecommons.org/licenses/by/2.0)], via Wikimedia Commons, accessed February, 2013. The Lander townsite was laid out by Frank B, Lowe, Peter P. Dickinson, and Eugene Amoretti of the Lander Townsite Company, and surveyed by a Mr, Quinn of Evanston in the winter and spring of 1883-1884. The plat was filed on June 9, 1884. The original townsite consisted of three 40-acre tracts. The main street of the town does not run due east and west, but rather follows the configuration of an early wagon road passing through the area to nearby Fort Washakie. The north-south running streets were laid out in a grid at right angles to Main Street. Although Lander was not platted until 1884, the main impetus for Euro-American settlement in the Lander Valley dates from the gold mining activity in and around South Pass City starting in 1867. Hundreds of gold seekers were lured to the region in hopes of striking it rich. Prior to gold discoveries in this district, thousands of emigrants passed through the region on the nearby Oregon Trail bound for Oregon, California and the Salt Lake Valley. However, until gold was discovered at South Pass, they had little incentive to linger in an isolated region dominated by often hostile indigenous Indian tribes. Starting in 1857, Frederick West Lander, of the Corps of Topographical Engineers, inspected the existing cut-offs of the Oregon trail west of South Pass as part of the Pacific Wagon Road program which sought to improve the western emigrant routes for travelers. Lander developed a new cutoff somewhat north of the existing alternatives which was ready for use by the 1859 emigrant season. During the fall and winter of 1857, W.M.F. Magraw, in charge of the road improvement expedition, built a temporary fort as winter quarters to await the next season on the Popo Agie River near present-day Hudson. This site was known as Fort Thompson or Fort Magraw and was garrisoned by 67 men. This fort was the first Euro-American settlement, albeit temporary, in the Lander Valley. The South Pass mining population soon discovered that the nearby Lander Valley provided an attractive location for farming, ranching, and other commercial pursuits with its lower elevation, fertile soils, streams for irrigation, and relatively mild climate. The high country mining communities, at first supplied by distant Salt Lake City, were later served by the Lander Valley settlers who provided meat, produce, and supplies. William Tweed brought the first flock of sheep into the area in the summer of 1869 and wintered them on Trout Creek about a mile south of the later site of Fort Washakie. The following year, Tweed and his son David established a ranch in Red Canyon. In the spring of 1871, they planted seven acres in vegetables and sold the produce in the South Pass mining area. Other early farmers included W.C. Barrett who established a farm on Barrett Creek in Red Canyon and sold vegetables to the South Pass mining area as early as the spring 1869. E.D. Young located at the mouth of the Little Popo Agie in 1869 and engaged in farming and raised cattle and horses. "Uncle" Johnny Chambers had a small vegetable garden outside of Lander. John Ramsey, E.F. Cheney and R.H. Hall were among the first ranchers to put cattle on the range. These and other early farmers and ranchers also sold their products to the military installations, first at Camp Brown and later at Fort Washakie. The Lander townsite was originally the location of Camp Augur (later renamed Camp Brown), a small military post established on June 28, 1869 to serve and protect the Shoshoni Indian nation on the newly created Wind River Indian Reservation. The reservation was created by the Treaty of July 3, 1868 between the United States government and Chief Washakie and the Shoshoni tribe. The site that later became the town of Lander was originally located within the reservation boundaries. These boundaries were later reduced in 1872, 1896, and in 1905. The first boundary reduction of 612,000 acres between the Sweetwater River and the North Fork of the Popo Agie River left the Lander townsite outside the reservation. Thus development of a town at this location was retarded until 1872. In 1871, Camp Brown was moved sixteen miles northwest and was renamed Fort Washakie. This military installation became the headquarters of the Wind River Indian Reservation. Remnants of Fort Augur's old log stockade were uncovered during the grading of Main Street in Lander's early years. The original Lander townsite was owned by pioneer Indian trader, scout, and miner, Frank B. Lowe; Peter P. Dickinson, a stockman; and Eugene Amoretti, a merchant banker and mining man at South Pass City was persuaded by Lowe and Dickinson to move to Lander and become a third partner in what became the Lander Townsite Company. When a post office was established here in 1875, Lowe named it Lander after his friend General Frederick W. Lander, who had established the nearby Lander Cut-off of the Oregon Trail in 1859. The townsite was favorably located on the main road to the Wind River Indian Reservation. A stage and freight route connected the Lander townsite to Green River City on the Union Pacific mainline via South Pass City. The first stage service on this route was established by C.C. Huntley & Co. in 1872. A second more direct route was laid out in the early 1870s to connect the reservation with Rawlins, the nearest rail supply point on the Union Pacific mainline. A telegraph line was also established along this route. This 150-mile route required approximately 24 to 30 hours of continuous travel and gradually usurped the major portion of traffic bound for the reservation after a disastrous blizzard in 1883 took several lives on the Green River City-South Pass City-Lander route. Stage service on the Rawlins-Fort Washakie route ceased on June 30, 1906 as the railroad approached Lander from the east. Henry Molson opened the first store on the Lander townsite in 1874. He was soon followed by Dickinson and Kime in 1875, then Major Baldwin, Eugene Amoretti, James I. Patton, J. Amoretti located his business in two buildings in the 200 block of Main Street. They were later replaced by a rambling adobe building on the site of the present Noble Hotel. Lowe's block, opposite Amoretti's block on Main Street, contained the Noble and Lane businesses and the Baldwin Company. Dickinson's block was the next one west where he built a residence and the Dickinson livery, feed and sale barns. Shiela Bricher-Wade, Wyoming State Historic Preservation Office and Robert D. Rosenberg, City of Lander, Lander Downtown Historic District, Fremont County, WY, nomination document, 1987, National Park Service, National Register of Historic Places, Washington, D.C.